Luxurious new contemporary villa of 250 m2 with private pool of 8m x 4m on a garden of 570m2. Located in a secure residence and guarded 24/7. 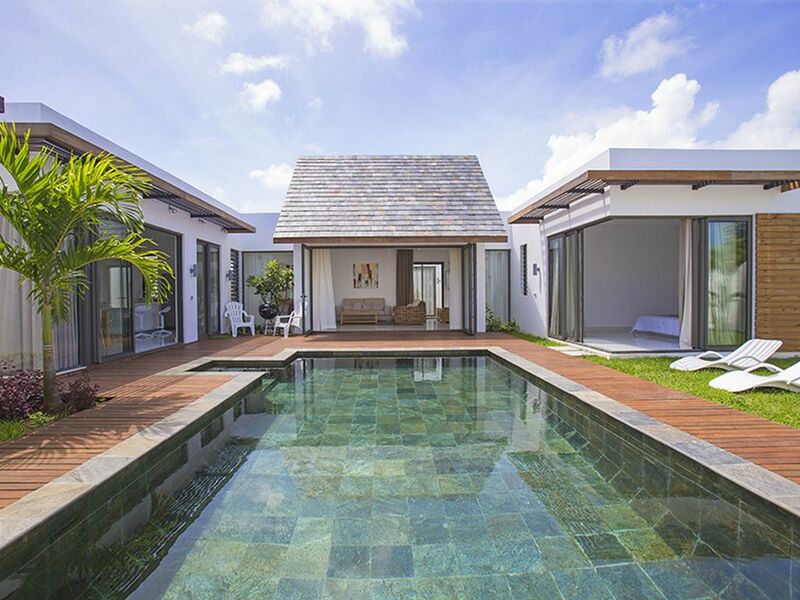 The villa is composed of 4 bedrooms, 3 bathrooms each with a toilet, a living room opening onto the tropical garden and pool by large windows, a fully equipped kitchen, a dining room, and a garage for 2 vehicles closed by electric gate. Villa connected to the internet by fiber optics, very bright in a quiet area 5 minutes from the Super U of Grand Bay and 3 minutes from the heavenly beach of Pereybere. Under the sun of the Indian Ocean, let yourself be surprised by the charms of the house. Light, quiet and easy living spaces will accompany during your stay! Natural materials: wood, stone, tropical garden, have the spotlight. The whole house is opened by bay windows giving on the tropical garden and the swimming pool, offering a large luminous volume and a convivial living space. LIVING ROOM: The vast, very comfortable living room is a particularly pleasant place of relaxation which is entirely glazed and it is enough to push the bays to give on the swimming pool and the pleasantly sported garden. The smart TV has a large 60-inch flat screen with Orange fiber connection, so you can connect to your music or be connected by Skype with your loved ones! DINING ROOM: The dining room is also fully open to the pool, a contemporary wood table will allow you to share the delicious dishes of Mauritian cuisine with many flavors. KITCHEN: the kitchen is fully equipped (ceramic hob, American fridge, oven and microwave, Nespresso coffee machine and all the equipment you want in a kitchen). It communicates with the laundry room where the washing machine and all the accessories are located (iron, ironing board, drying rack, safe ...). PARENTAL SUITE (master): The air-conditioned room, opened by two bay windows sliding in angle, gives on the swimming pool. It is equipped with a king size bed in 180 cm for soft nights. A large dressing room to store your luggage and personal belongings next to the toilet and the bathroom. It is equipped with a double vanity unit, a large walk-in shower and an outdoor bathtub to relax. THE BLUE ROOM: Air-conditioned room, with a 160 cm bed. It has a private garden and a bathroom with Italian shower, sink, mirror and toilet. THE CHAMBRE CHILD: Air-conditioned room with a bed 140cm with storage space. She shares the bathroom of the blue room. This room connected to the blue room by the bathroom offers an ideal sleeping area for a couple with 2 children. THE ROOM STUDIO: This room, air-conditioned, has an independent access and also gives on the swimming pool. It is equipped with a King Size bed 180 cm. This room has its own bathroom with Italian shower, sink, mirror and toilet. THE GARAGE: the garage welcomes two cars and is secured by an electric gate with remote opening. THE GARDEN: Our 8m x 4m, flat-bottom, quartzite-stone swimming pool will allow you to relax, swim and cool off. Deckchairs contemporaries, and other chairs, parasol ensure an optimal setting to relax under the watchful eye of our magnificent Buddha. The maintenance of the pool and garden is scheduled once or twice a week (depending on the period) to ensure crystal clear water and total well-being. In our guests' opinion, the 6m x 4m PALM LEAVES KIOSK is the main living area of ​​the villa. You can relax during the day, away from the sun, caressed by the trade winds and share moments of conviviality in the evening with the barbecue a few meters. A cleaning lady is provided in the rental. It is present Monday to Friday from 9h to 14h and Saturday from 9h to 12h (except Sunday and holidays). The preparation of meals is possible on request. Very concerned about the quality of the well-being that we propose to our guests during their stay, and, aware also that each visitor can have specific needs, we are always available to answer as quickly as possible your requests and your proposals to improve the quality of service we provide you. Thank you very much Jeannie for you comment on your stay in our villa. We are very happy that you and your family have spent a great end of 2018 in our house. I will inform Anne Marie and Emmanuelle about your kind words, they will appreciate for sure, because they told me so many good things about you and your family :-)! I note the point about the information manual, sorry about this and I agree with you at 100%. That will be fixed next week during my stay ;-). We wish you again all the best for 2019 and hope to see you again in Mauritius. Une maison magnifique, tout y est parfait. Un vrai bonheur partagé en famille, nous avons apprécié la déco moderne et chic avec le souci du détail, la qualité des matériaux... la piscine privée, le jardin parfaitement entretenu, le coin repas, le barbecue, la propreté irreprochable, sans oublier l accueil d'Emmanuelle qui nous a communiqué de bonnes adresses et qui a répondu à toutes nos demandes et tous nos remerciements à Anne Marie qui entretien la maison chaque jour dans la discretion. Je recommande les petits plats préparés par anne marie qui sont un régal ! Des vacances parfaites, nous sommes impatients de pouvoir revenir, nous conseillons vivement cette villa. La villa est conforme a la description et aux photos, nous etions en famille avec un bebe tout cest passé comme prevu , le proprietaire nous a permis de passer un voyage en maison avec un service digne d'un grand hotel( menage, serviettes a disposition, draps propres etc etc ) nicoleta est adorable et tres disponible , la maison est tres securisee et a proximite de commerces et des plages ( 5 min en voiture) . Je recommande cependant de louer un vehicule pour vous deplacer sur l'ile. Je recommande sans hesiter !! Belle Villa équipée et très bien située à quelques centaines de mètres de la plage de Pereybere. Séjour très agréable dans une villa aux prestations haut de gamme. L'accueil d'Emma très gentille et disponible fut à la hauteur. Quant à Nicoletta, elle a été aux petits soins toute la semaine et nous a régalé de recettes locales réalisées à partir de produits frais que nous lui procurions chaque jour. Une excellente adresse. Nous avons passé une semaine dans cette villa. Tout était parfait! Je recommande pour des vacances de rêve sous le soleil. Je recommande vivement cette villa, nous avons passé un excellent séjour dans celle-ci. Elle était a la hauteur de nos espérances, bien agencée, très spacieuse, situé dans un quartier calme. Les propriétaires sont à l'écoute et disponibles, ils nous ont bcp aidé. Pour finir je me répète, nous recommandons mes amies et moi cette villa !!! Wide choice of visits, attractions and walks listed in a book available to tenants in the villa. LE TARIF INDIQUE INCLUS : - LE LINGE DE MAISON (Draps de lits, serviettes de toilette et de transats) - LA CONNEXION INTERNET PAR FIBRE OPTIQUE. - LE SERVICE D'UNE DAME DE MÉNAGE DU LUNDI AU VENDREDI DE 9H à 15H et LE SAMEDI DE 9H à 12H. Repas possible moyennant un petit surplus à voir directement sur place avec elle.